Controversy continues to rage about closures – and this year’s Playhouse WineFestival was no exception. Cork is king says the old world, stelven is stellar says the new. Now there’s no question this is a man with a sense of humour to go along with his extensive wine knowledge. Earlier, he’d explained the reason one of his wines is named Ecclesiastical Sin is because they are still, centuries later, trying to uncover the link between the Abbot of the monastery that once owned the vineyard and a lady of somewhat dubious repute named Dona Maria. He’d also described his response when a journalist, intrigued by the concept of pressing grapes by foot, had once asked: but how do you get rid of the hair of the legs? “Simple, you just go ptoot, ptoot, ptoot.” His imitation was spirited and his grin irresistible. But when it came to closures, there was no room for debate. 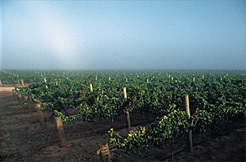 Cork is king in Cristiano’s vineyards. Fast forward to the following evening at a lively tasting of Aussie Shirazes entitled Regional Heroes. “I don’t want any more of those filthy rotten corks,” said Bruce Tyrrell principal of Tyrrell Wines. A ripple of spontaneous applause went through the room. From the back, the outspoken and much loved Aussie Master of Wines, Michael Hill Smith quickly forestalled another question. “And if you define romance in your life by the pop of a cork, you really need to get a life.” More applause, this time punctuated by a few cheers. 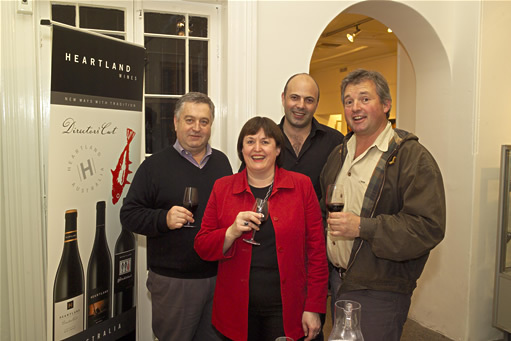 An interesting side note: this was also the only tasting we attended with a senior lady wine principal in evidence – Vicki Arnold, general manager of Glaetzer Heartland Wines shown here with Grant Tilbrook, Ben Glaetzer, and Scott Collett (left to right – we know you know which one Vicki is). One final anecdote in the spirit of cultural exchange – a little known definition among gourmets from Down Under. Moderator Mark Davidson maintained an absolutely straight face as he informed the gathered group that it was on a visit to the Margaret River wine district he learned the local definition of a seven-course Australian dinner: that would be a six-pack and a meat pie. And while debate over cork versus stelven will likely remain as hot as the Aussie sun far into the future, one panelist finally asked an even more burning question. “What’s the difference between a winemaker and god?” The answer is simple. God doesn’t think he’s a winemaker. Photos at the top of the page courtesy of Heartland Wines. This entry was posted in corks, screw caps, Stelvin and tagged Australia, Ben Glaetzer, corks, Dona Maria, Douro, Food, Recreation, Screw cap, stelvin, Wine, Wine tasting. Bookmark the permalink.